Santa Claus is one of the most revered mythical icons that inspires fun, hope, and joy across the globe. Now that the holiday season is upon us, I starting thinking about how we as student life professionals share many of the same attributes as our trusted friend from the North Pole. 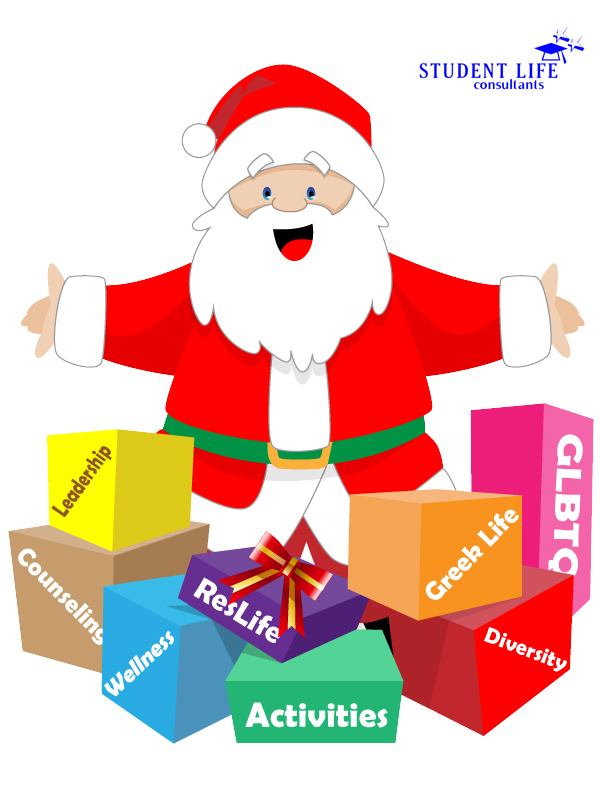 I feel that Santa Claus could be the perfect Student Affairs professional! Santa Claus Nurtures and Appreciates Diversity – Santa delivers toys to children all over the world. In order to do this, he must understand all of those cultures and languages. Santa does not discriminate as he spreads the spirit of the holiday to all children. Likewise, Student Affairs professionals serve and help develop students of varied and diverse backgrounds, cultures, abilities, socioeconomic statuses, and a multitude of other differences. Santa Claus is Everywhere – From midnight to before the break of dawn on Christmas, Santa magically accomplishes the impossible task of spreading excitement across the globe. Furthermore, he is in cartoons, movies, holiday decorations, and most importantly, in the hearts and minds of everyone during the Christmas season. Student Affairs professionals also perform magic throughout the year to assist, educate, and inspire college and university students. We are seemingly everywhere within the university community. Whether we are participating in committee meetings, sporting events, conduct hearings, training sessions, and advising conversations, our mission is to be involved in all aspects of the student experience. Santa Claus is a Servant Leader – Santa Claus is a shining example of a servant leader. Not only does he serve children all over the world, but he also takes care of and supervises an army of elves and a herd of magical reindeer. Student Affairs professionals are also servant leaders at heart. Our core mission is to develop and serve the students who come to our colleges and universities. We aim to make students more educated and prepared for when they leave us. How else does Santa Claus embody the spirit of Student Affairs? Please share your thoughts below and “Like” on Facebook and Tweet if you enjoyed this post. Thank you for all that you do and Happy Holidays! This entry was posted on Monday, December 23rd, 2013 at 9:00 am and is filed under Leadership. You can follow any responses to this entry through the RSS 2.0 feed. You can leave a response, or trackback from your own site.